So which one was I going to get? There are a few beauties on my list. 3. 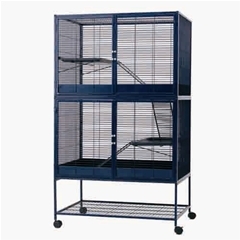 All different kinds of aviary cages, height is a good thing for rats. These can vary in price from €80,- to €250,- depending on how big the doors are and how many accessories it comes with. So, what to do what to choose. Well, looking at all these prices you may have concluded with me that a secondhand cage will be more fitting for the budget. And it so happens I have bid on a RS and a Furet Tower. I’m thinking it will become the tower, since it seems to be in a better state. I’ve bid €100,- and I am going to take a look (and take it with me) next Saturday. Oh yes, paradise is just around the corner… Will keep you posted with news(and hopefully pics).